56 Leonard street condominium, designed by world renowned architect Herzog & de Meuron rises into the sky as a series of stacked residences creating a cascading 60 story glass tower that has taken the mantel as NYC's most iconic landmark. The building base is seamlessly integrated with a specially commissioned work by famous sculptor Anish Kapoor blending the one of a kind streetscape with the lobby's sleek interior. 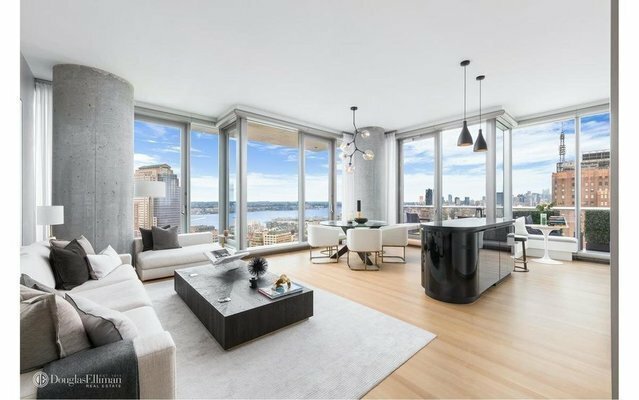 Soaring 31 Stories above Manhattan, this spectacular NW Corner 3 Bedroom, 3.5 bath home, (2,177 s.f. with 217 s.f. of exterior balconies) offers mesmerizing vista views from every room. Apartment features include: 11' tall ceilings paired with a spectacular glass curtain wall, solid white oak floors, 2 large balconies with stone pavers and open glass railings, a 24' by 29' great room with an open kitchen outfitted with custom cabinetry, top-of the line fully integrated Miele and sub-zero appliances, granite tops and an exterior vented gas cooktop. A spacious master bedroom with ensuite bath that includes a free standing tub double integrated sinks, recessed lighted medicine cabinet and travertine marble floors with radiant heat, two additional bedrooms both with ensuite marble baths and a powder room with stone floors and custom stone slab sink and mirror.. Motorized remote control window shades to be provided by owner, only two apartments off the elevator. The 9th & 10th floors offer residents 17,000 square feet of amenities, including a Sky Estuary with a 75 foot lap pool, Library Lounge, Indoor/Outdoor Theatre, Children's Playroom, Landscaped Outdoor Sundeck and Hot Tub, Fitness Center & Yoga Studio, Treatment Room, Steam Room, Sauna, Private Dining Salon with separate Catering Kitchen and Conference Center. Located in the heart of Tribeca, in walking distance to some of the city's finest shops and celebrated restaurants, residents can stroll down romantic and storied streets experiencing the quaintness that has given the neighborhood a global appeal. Tribeca's famously rich architectural setting, destination galleries, museums and public art make it the cultural focal point of lower Manhattan.